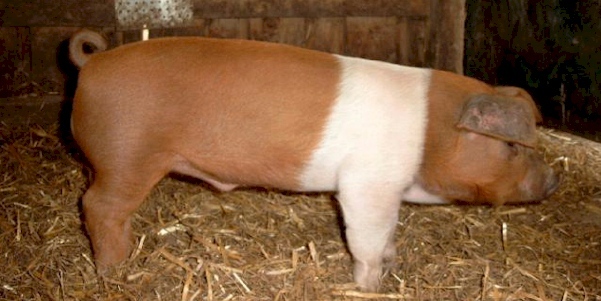 The Danish Protest Pig is a rare breed of domestic pig. Due to its red color, its broad white vertical belt, and a trace of a white horizontal belt it resembles the colors of the Flag of Denmark. It originated in North Frisia in Southern Schleswig in the beginning of the 20th century, when Danes living in the area were not allowed to raise the Danish flag and kept and displayed the Protest Pig instead, making it a symbol of their cultural identity. They grow up to 350kg. They probably were created out of Holsteinian and Jutlandian marsh pigs, the English Tamworth pig, and red variants of the Angeln Saddleback. They were recognized as a unique breed in 1954, but after a last birth in 1968, the race was considered extinct. Luckily many years later, in 1984, pigs fully corresponding to the descriptions of the race were seen again. Associations of breeders continue to breed them and to register existing pigs of this breed. Breeding populations now exist in the Berlin Zoological Garden, the Hanover Zoo, the Tierpark Arche Warder near Kiel, in Erlebniswelt Gelsenkirchen, in Dalmsdorf, Hof Lutjensee und on the Archehof Blumencron. The Dortmund Zoo and the Tierpark Krüzen house small populations as well. At the moment, around 140 specimens are alive worldwide. The German federal state of Schleswig-Holstein supports preservation of the race for its cultural value.